As announced in March, the Committee selected Michael T. Daggett (Associate ? AZ) as their Vice Chair nominee, who will accede to the office of NASBA Chair 2010?11 should he be elected at the Annual Business Meeting, on November 3, 2009. 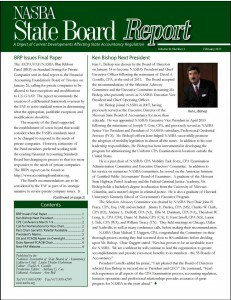 Nominations may also be made by any five member boards if filed with NASBA Chair Thomas J. Sadler at least 10 days prior to the Annual Business Meeting. No nominations from the floor will be recognized. A majority vote of the designated voting representatives of the member boards attending the Annual Meeting shall constitute an election provided a quorum is present. Under the provisions of NASBA’s Bylaws, at the 2009 Annual Meeting, Billy M. Atkinson (Associate – TX) will accede to the office of NASBA Chair and Mr. Sadler (Associate – WA) will accede to the office of Past Chair. Continuing to serve for the balance of their unexpired terms: Directors?at?Large (third year of a three?year term) – Sally Flowers (Associate – CA), Gaylen R. Hansen (Delegate – CO) and Leonard R. Sanchez (Delegate – NM); Directors?at?Large (second year of a three?year term) – Richard Isserman (Delegate – NY), Theodore Long, Jr. (Associate – OH) and Kathleen J. Smith (Associate – NE). Great Lakes – Myra A. Swick (IL); Alternate – Ray G. Stephens (OH). In addition, the Pacific Region elected Raymond Johnson (OR) to complete the remaining year of Mr. Daggett’s term as an alternate member for the Nominating Committee.